If you usually bring three hankies to prepare yourself for the demise of poor Butterfly at the end of the performance, you are advised to bring along the whole box for this production. No opera company in the world can come close to matching the grace and fragility of Cio-cio-san in this elegant and poignant production of Puccini's operatic icon. And when the end comes, the audience has been drawn so tightly into the lives of the characters on stage that everyone in the theatre feels the pain and experiences the life running out of the tragic character before them. An elegant cast of marionettes are exquisitely adorned by Masako Hayashi who recently did the costumes for the New York City Opera production of Madame Butterfly. But, unlike conventional theatre, it takes three separate marionettes just to play the single role of Madame Butterfly. This is necessitated because the 16-26 control strings often go right through the costume thus making "costume changes" impossible. 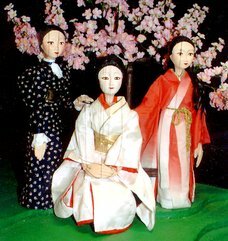 We refer you to the photo on this page which shows the three marionettes needed to portray Madame Butterfly. You see her in her wedding kimono, her "American" couture and her costume for the final and tragic scene as the truth becomes evident and course is clear. The 1997 production saw completely new sets as the company prepared the show for the 1998 Boston tour. Madame Butterfly was first performed by the New England Marionette Opera in its 1992 inaugural season. It was completely redesigned prior to an extended run in 1994. The 1998 production will be the first to use the theatre's unique TransTitle® video projection system which sends English language translations of the Italian lyrics to a screen just above the stage. Prior to TransTitles, the theatre utilized numerous slide projectors and dozens of racks of 35mm slides.